Hi, this is Joda. He's a bit shy and is five years old. After I get up in the morning, I go out and give him fresh hay. In the afternoon he's in the garden with his friend Suse. Often I take him out and play with him. Joda is very sweet but a little shy. I like him because he is quiet and likes cuddles. He can do some tricks. His favorite food is hay, and he also likes carrots, lettuce and hazel twigs and leaves. We got him and Suse when they were ten weeks old. He lives in a house with spout. Together with my family, and many other pets we live in Gaggenau. I love him, he is dear to me. Hello, Joda in Germany and hello to Suse too! 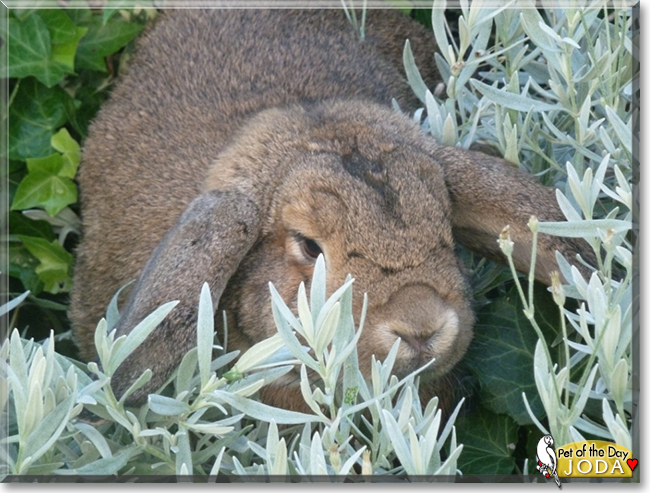 Happy Bunny Pet of the Day! What a beautiful bunny you are! I like your golden brown fur with the dark strip on your head and back, and your cute lop ears! You have a schedule for each day - you start with fresh hay from your person, and then you and Suse spend time in the garden! You often enjoy play time with your person, and you also enjoy cuddles! Hay is your favorite food, and you also like lettuce or carrots. You live with your people and other pets! Perfect! I would be very glad to give you some pats or a cuddle today, Joda -- since I can't, I hope your person will give you extras for me Happy Bunny Pet of the Day to Joda, and love to Suse too! Dearest Joda, you are adorable! You're so cute with that soft-looking fur and the sweet face and lop ears. In the morning you eat fresh hay, and in the afternoon you're in the garden with your friend Suse. You and she joined your family at age ten weeks. You and Suse and all your family members, humans and other pets, love each other very much, don't you. What a wonderful love-filled home you share! Congratulations, darling Joda, on being chosen today's Pet of the Day! We hope you and Suse and all your family members, humans and other pets, and friends are enjoying a fine celebration, full of fun and lovies and all your favorite games and treats, maybe a special serving of yummy hay, carrots, lettuce, and hazel twigs and leaves! Last edited by phesina; 10-29-2018 at 04:44 PM. full of fun good food and best of all, love. Greetings, Joda in Gaggenau, Germany! Happy Pet of the Day! What a beautiful, most precious Lop bun you are, Joda; beautiful in looks (so soft and cuddly ) and packed with personality; a tad shy, but oh so sweet; the ultimate cuddle bug and lap warmer! No wonder your human loves you so very much, Joda! In looks and in personality, inside and out, you're just as special as can be, a treasure! How lucky you and Suse and all of your furry siblings and friends are, living the good life there in Gaggenau with your devoted human, your loving family, being treated to all the best that life has to offer, most of all, love! You truly are one extra special boy, Joda, simply the best, and so very deserving of your big day of honor! Thanks for the BIG smiles, Joda! Meeting you this evening, reading your proud human's love filled tribute, has been a real treat! I hope you're enjoying a very special Pet of the Day celebration, sweetheart...playing with Suse and all of your furry friends, munching on yummy lettuce, carrots and hazel twigs, cuddling with your human, being loved and pampered to pieces! Lots of love, cuddles and kisses to you, precious Joda, our very special and most deserving Pet of the Day, EVERY day! Love to dear Suse and all of your furry friends, too! Shy, sweet Joda is very special and lovely little bun, perfect POTD!! What a handsome bunny you are, sweet Joda!